Two direct-to-home television broadcast satellites that will provide expanded relay capacity over the Americas have been orbited on Arianespace’s latest success with its Ariane 5 launcher, performed today from the Spaceport in French Guiana. Lifting off from the Spaceport’s ELA-3 launch complex, the workhorse vehicle deployed its two spacecraft passengers – DirecTV-15 for DIRECTV of the U.S. and SKY México’s SKY México-1 – during a flight lasting approximately 38 minutes. This mission’s total lift performance was estimated at 9,960 kg. The performance and reliability of Ariane 5 was demonstrated once again during today’s mission from French Guiana, and was recognized by the customers on this 79th flight for Arianespace’s heavy-lift workhorse. While dual-payload deployments are a trademark of Ariane 5 missions, today’s flight was unique – with both passengers focusing on the same application (direct-to-home television broadcast) and scheduled to operate above the same area of the world (the Americas). Arianespace Chairman and CEO Stéphane Israël, who commented from the Spaceport’s mission control center, put emphasis on Arianespace’s long-standing service to the Americas, and particularly the United States – orbiting commercial payloads, and contributing to various cooperation programs with the U.S. government by providing launch services for scientific satellites, cargo vehicles to the International Space Station and security payloads. As the upper passenger in Ariane 5’s payload arrangement, DirecTV-15 was deployed first in today’s flight sequence. It was produced by Airbus Defence and Space using the Eurostar E3000 platform, and is among the most powerful broadcast satellites ever built for the United States. DirecTV-15 is to operate at five different orbital positions between 99-119 deg. West – from which it will provide capacity in the Ku-, Ka- and R-bands for DIRECTV, one of the world’s leading suppliers of digital television entertainment services with more than 37 million customers in the U.S. and Latin America. This was the 111th payload from Airbus Defence and Space to be launched by Arianespace. 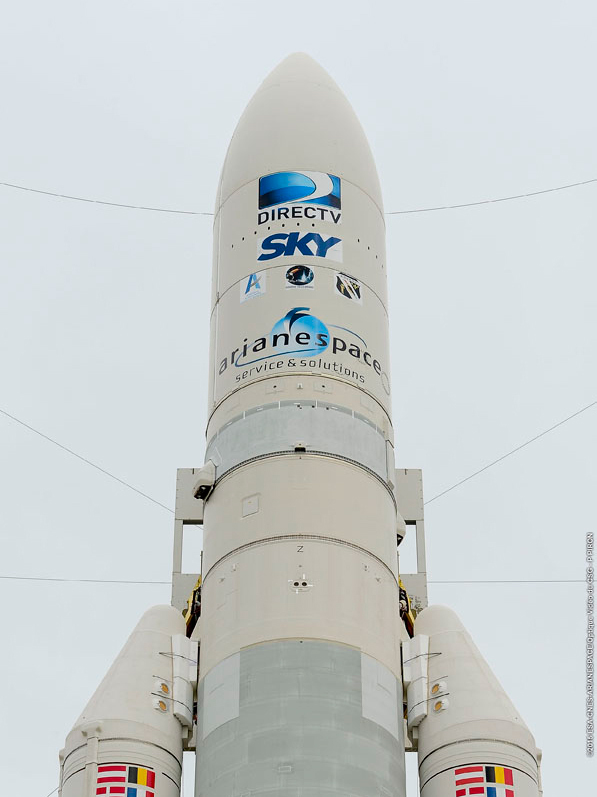 Ariane 5 is shown in the Spaceport’s ELA-3 launch zone prior to its liftoff on Flight VA223 with the DirecTV-15 and SKY México-1 satellites. The second payload deployed by Ariane 5 on today’s mission – SKY México-1 – will be operated for SKY México, which is owned by Mexico’s Grupo Televisa S.A.B. and DIRECTV. “Like the vast majority of communication satellite operators, SKY México selected the Ariane 5 launch system to orbit its first satellite, placing the emphasis on quality, reliability and availability,” said Arianespace’s Israël. SKY México-1 is an Orbital ATK, Inc.-built satellite based the GEOStar-2 platform, and it carries Ku- and R-band transponders deliver to services to the Mexico, Central America and Caribbean regions. With Ariane 5’s latest success, SKY México-1 became the 26th spacecraft from Orbital ATK, Inc. that Arianespace has launched. Today’s mission – designated VA223 in Arianespace’s numbering system – was the 223rd Ariane-series mission to date, as well as the 79th for Ariane 5. It also continues Arianespace’s busy launch schedule in 2015, during which the company is targeting 11 mission in total – based on the availability of payloads – deploying its full family of the heavy-lift Ariane 5, medium-lift Soyuz and lightweight Vega launchers. Flight VA223 was the fourth mission in 2015 using an Arianespace family launcher, following one previous mission each with Ariane 5 (Flight VA222 with THOR 7 and SICRAL 2, performed on April 26), Soyuz (VS11 with two Galileo Full Operational Capability satellites, conducted on March 27), and Vega (Flight VV04 with Europe’s IXV spaceplane, carried out on February 11). Arianespace’s next launch – Vega Flight VV05, scheduled from the Spaceport on June 22 – will loft the Sentinel-2A payload, which is the latest in Europe’s series of Earth observation satellites for the Copernicus initiative.